Marx Toys 12″ action figure experts, Scott Stewart and Tom Heaton are joined by Rudy Panucci and Buddy Finethy to discuss Johnny West, Stony Smith and the Marx family of 1/6 scale figures.Marx produced action figures that, like GI Joe, were 1/6 scale, with adult figures standing nearly a foot tall. Unlike GI Joe, Marx figures had molded-on clothes (except for accessory pieces) and were mostly manufactured in Glen Dale, West Virginia. This makes finding rare variants and oddball short-run figures much easier since there were so many that made it out of the factory. 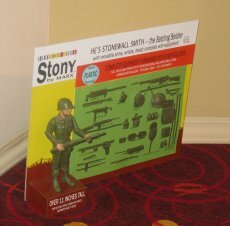 Scott is the man behind Stewart’s Best of The West, an ever-expanding website that compiles information on Marx action figures. Tom is the author of several books on Marx figures and is the keeper of The Vintage Toy Room. Both sites also offer items for sale. Recorded March 16 2014 at JoeLanta with some editing due to technical glitches with the camera.